The company has said thattravellers can expect rail replacement buses to continue along the line at weekends. 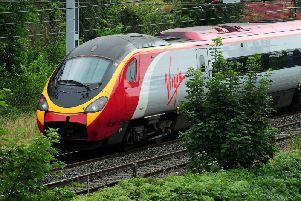 Rail users have been warned to expect further disruption to their journeys following a delay in completing the line upgrade between Preston and Manchester. Network Rail advised its customers today that "poor ground conditions" have delayed the completion date for the electrification project from May to Summer 2018. Travellers have been told they can expect rail replacement buses to continue along the line at weekends during this period. The company says that progress has been hampered by unexpected running sand and hard rock in the vicinity of old uncharted shallow mine workings. Martin Frobisher, route managing director of the London North Western Route at Network Rail, said: “While we are disappointed to miss our May 2018 target on the Manchester-Preston upgrade, it is important we view this within the full context of the Great North Rail Project. "The ultimate prize for customers is 2020 when Network Rail’s current GNRP upgrades are fully complete. Jerry Farquharson, service planning director for TransPennine Express, said: “It is disappointing that this complex project will now take longer to complete. Rob Warnes, performance and planning director at Northern, said: “This is disappointing news for our customers who will have a longer wait, with more disruption, before they can experience the service enhancements Manchester to Bolton electrification will make possible. The work Network Rail still needs to do on the Manchester-Preston scheme is the installation of foundations for steel columns to carry overhead power lines at Chorley, Bolton and Salford. The company says that due to poor ground conditions at these locations, three out of every 10 foundations have been unsuccessful at the first attempt. This had added time to the programme. Some 1,700 (89%) foundations are already in place at Preston, Chorley, Horwich and Bolton. But there are 200 still to put in. Another challenge, which slowed the scheme’s progress, was the need to carry out emergency repairs to Moses Gate railway bridge in Bolton last year after it was damaged by a burst water main. Network Rail’s Preston-Blackpool is progressing well and due to finish as planned by May this year.